Generating and sending invoices can be a time-consuming process. A properly designed invoice helps a business get paid and provides legal protection for both parties. Think about it, all the hours and energy you put into completing a project will have an invoice at the end of it. Invoices are the tool that provides freelancers with the ability to receive income. 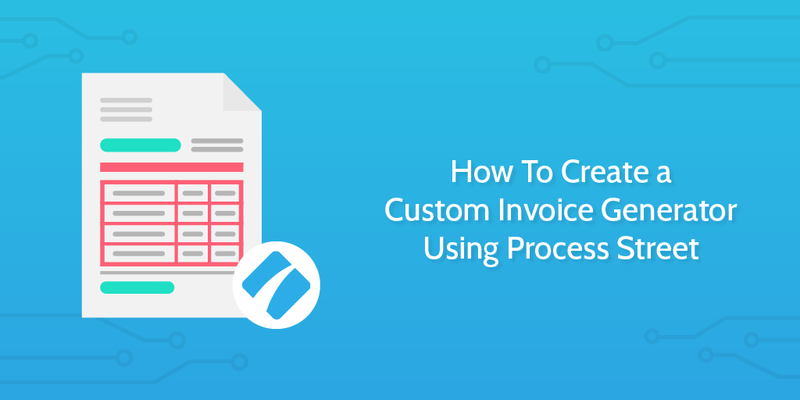 That’s why we over at Process Street sat down and thought up a way to make getting paid even easier; a template which serves as a custom invoice generator. Never again worry about charging your clients the wrong amount, or even sending them an invoice with an outdated logo or set of information. All you need to do is plug your information into this template and away you go! First things first; the invoice generator checklist. Below is a public version of the template itself – it’s short, easy-to-use and effective. Go ahead and try it out, but as a warning, you won’t be able to generate your invoice until you’ve linked it up with WebMerge or your email (which we’ll get to in a second). Note that, if you do not have a Process Street account, you will need to sign-up to gain access. If you already have an account, why not grab a copy of this checklist to use at any time by clicking “Give me this checklist”? Once you’ve seen the checklist and tried storing your own data in it, let’s get into the good stuff; how to automatically generate an invoice with it. ‘Trigger‘ – this will set your Zap into motion. In your case, it will be when checking off a task in our checklist. Once this has been done, it sets off the Zap, almost like a mousetrap. ‘Action‘ – this will be done by the Zap. For you, it will send an automatic email to your client with the info you filled out – leaving you to do more important work. It is free to create an account on Zapier and you can create up to 5 Zaps. If you’re looking for more Zaps and other features, their pricing plans start at $20/pm. Setting your account up is easy. On Zapier’s home screen, go to the top right and click on ‘Sign Up For Free‘. Then, fill in your information, verify your account via an email and then you’re good to go. You’re going to need to create a new Zap. Once you have signed up, you will see an orange button on the home page labelled ‘MAKE A ZAP!’. Click on that to begin our Zap making process. You will have a page that looks like below. You’re going to want to click on ‘Process Street‘ (which you may need to search for) in order to set it as your trigger app. This is because you want to create the invoice from the invoice generator checklist. 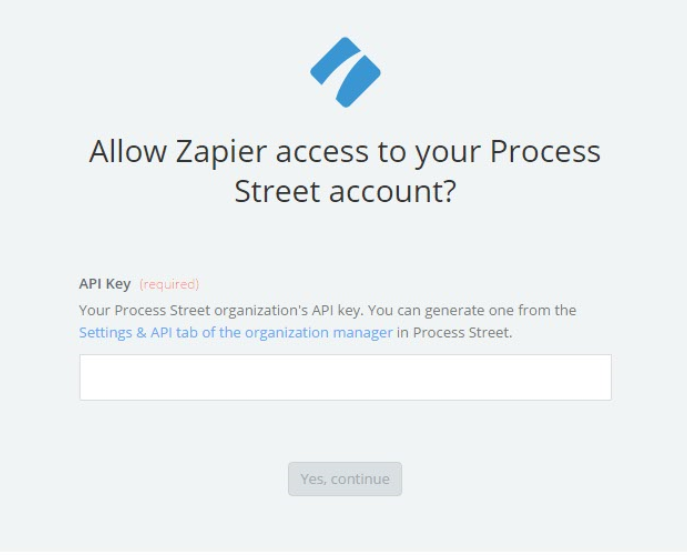 Once you have selected Process Street as your app, you will choose your trigger. Your trigger will be ‘New Task Checked‘, meaning that when a task you choose is ticked as complete in PS, the invoice will be generated. Once this has been checked, this is what will set the action step off, producing your document. Click on the hyperlink ‘Settings & API tab of the organization manager‘ – this will take you to your organization in Process Street, where you can generate an API key. Do so, then enter it into the box above and click ‘Yes, continue‘. You will then be redirected to the screen below, click ‘Test‘ to ensure it has worked. If successful, hit the ‘Save + Continue’ button. Once your account has been connected it is time to set up your options. These are what allow you to specify what template and task the invoice will trigger from. To do this select ‘Creating an Invoice‘ in the ‘Template‘ section. You will then select ‘Generate the Invoice‘ in ‘Task‘ and it should look like the following. Click ‘Continue‘ when you have the above done and this is where it will tell you if it is successful or not. Once you have set up your Process Street trigger it is time to pick your invoice generator method; using WebMerge or your email. 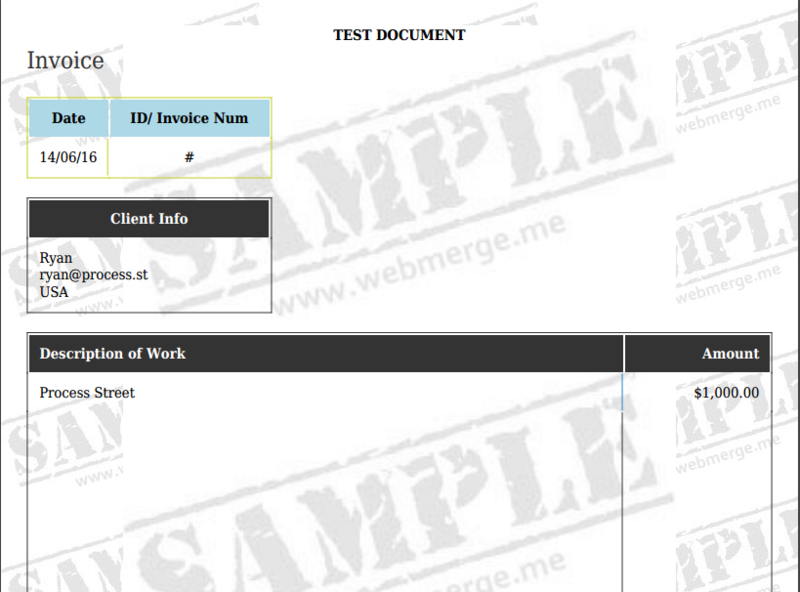 Generating invoices in WebMerge is easy for people who don’t have coding knowledge. The account is easy to set up, but if you choose a free account your invoice will have a ‘Sample’ watermark on it (Click here to see what I mean). If you’re going to use this professionally, pay for the pro plan. The end product is great, it provides a simple template that you can send to your clients. All input fields are customizable which makes for an easy experience. The downsides to a free account are that you get 5 merges in total unless you upgrade your account, with pricing starting at $29 per/month. Plus the annoying ‘Sample’ watermark all over your merges. On the other hand, using email is a free method that is great for people with some prior knowledge of coding. 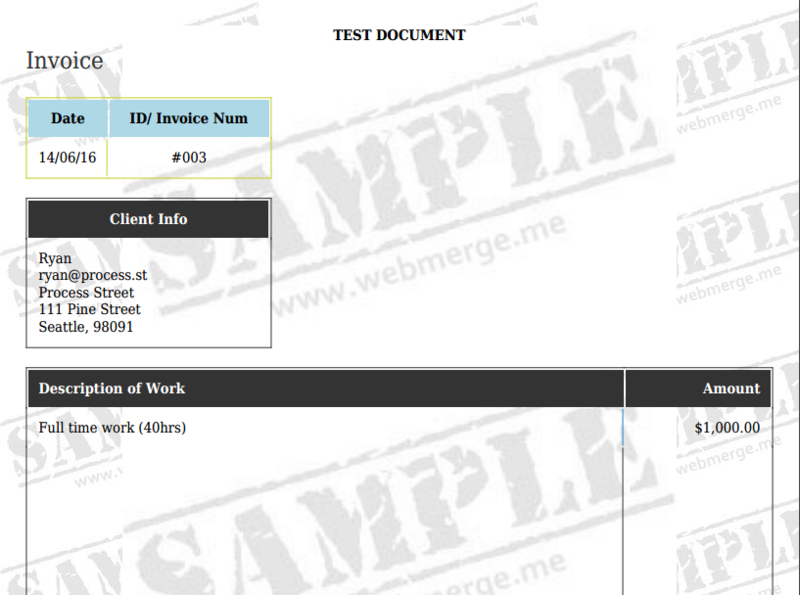 If you’re not using WebMerge as your invoice generator, then skip ahead to the Email section. If you’re unfamiliar with WebMerge, I will explain it in a sentence. WebMerge is an online platform that allows you to collect data, populate a document and send it to any contact automatically. In our case, it can take the information from out invoice checklist and use it to populate an invoice document. To use WebMerge, you will need to create an account. Follow the steps below to do this. On the front page, click on ‘Try it Free’ on the top right of the page. On the next page, enter your details, then click ‘Create My Account’. Once done you will receive a verification email; you must click this in to access platforms features. Read through the tutorial so you understand what WebMerge does. You will then do the following. Once you have chosen the Document Builder tab like the screenshot above, click on ‘Switch to Advanced Mode’. You will use one of the below templates. They are similar, but with my code, not much editing needs to be done. If you want your own custom template, use the WebMerge example. Using the templates will give you a simple invoice document layout. If you choose my code, copy it within the ‘Switch to Advanced Mode’ area. Then click ‘Switch to Editor Mode’ this will be where ‘Switch to Advanced Mode’ was. If you choose the WebMerge example, you have to click ‘start with this template’, ‘add template to my account’ and then you’re good to go. You can change the timezone, filename, and any other fields if you wish, this will not affect anything. That is what your invoice will look like when sent to your client. Type ‘Invoice’ in the ‘Subject’ field, and fill in the ‘Message’ field with whatever you wish, but you can use what’s in the screenshot below. It is time to select your first action step in Zapier. This is the final piece of the puzzle. Once the Zap has been triggered, it will then go to the action step to send the information from your Process Street Checklist to your client. Choose ‘WebMerge‘ as your action step like the following. You have to choose your action. This is what will happen with your information when the trigger has been set off. You’re going to pick ‘Create Document Merge‘ like the screenshot below. This will create a new document with your Process Street Checklist information that gets sent off to your client. Click ‘Save+Continue‘ to go to the next step. 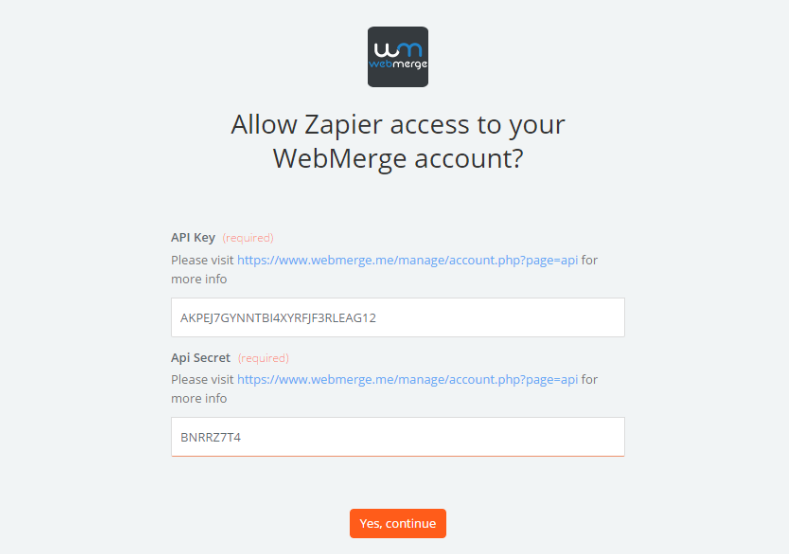 Imitating what you had to do with the Process Street trigger, you’re going to need to connect your account, enabling Zapier access to WebMerge’s API. Click ‘Save+Continue‘ and you can carry on through to the next step. It is time to link up your WebMerge template, which is the invoice you created earlier. This will allow your invoice generator checklist information to go into the chosen template. Once you’ve done that, you will populate the rest of the fields by using the button to the right of each field and choosing your Process Street checklist’s form fields. Scroll down to the bottom of the page and click the ‘Continue‘ button where you can test your WebMerge file. Once your WebMerge action is complete, you can name your Zap, I recommend calling it ‘Invoice‘ and you will know what it is for. Click the ‘Off‘ button, it will then turn to green and your Zap is currently active. You made your first Zap! If you don’t want to pay and you can follow basic instructions, then using email as your invoice generator could be better for you. Plus it is free. There are other ways to send emails via Zapier, you can use apps such as Gmail and Mandrill. The configuration for both of these are similar but you’re choosing a different app. If you’re not using WebMerge, you still need to have the Process Street Trigger set up that was laid out earlier before continuing to set up email as your action. Once the Process Street Trigger has been set up, It is time to select your action app. This is the method that will be used to send your invoice automatically to your client. Once you have chosen your action app, it is time to select your action step and this is how your invoice will be sent. Click on ‘Send Outbound Email‘ like below and then press ‘Continue‘. Once your action step has been selected, it is time to set up your action template. This is how your information will be collected. Using the boxes to the right as circled below, you will select the form fields from your Process Street Checklist to fill in the required information boxes. The ‘To‘ box has the Client’s email address form field selected, this is who the invoice will be sent to. In the ‘Subject‘ box, type in ‘Invoice‘ as this will be the subject of the email your client will receive. To fill in the Process Street Checklist information, you need to click on the red text boxes like below. Congratulations, you created an invoice template! I hope this helps you save time when creating invoices. Enabling you to focus on more important tasks that need completing. I miss one thing – where do you pull the actuall items listed in the invoice. What steps would I need to take if I wanted to bill based on i.e. JIRA work logs. Your trigger for JIRA could be when an issue has been closed your action step then takes the information from that issue and pushes to generate the invoice.